"In this Idahoan approach to lasagna, we've layered our creamy Au Gratin Homestyle Potatoes with vitamin-rich kale or spinach and a pumpkin Parmesan sauce for a delicious taste of autumn." Prepare Au Gratin Homestyle Casserole following "stove top" directions on the package. In a 9 x 13 casserole dish, layer half of the potatoes on the bottom of the dish. Sprinkle 1 cup of the spinach or kale over potatoes. 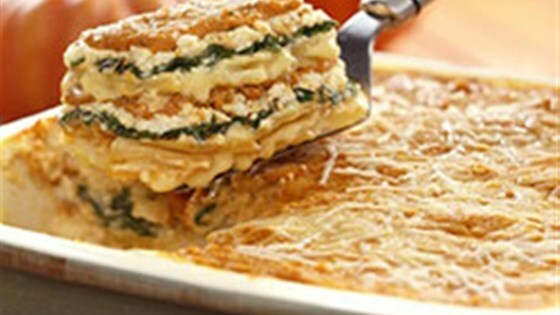 Blend the ricotta and eggs together and use half of this mixture to layer on top of the spinach. Layer next with 1 1/2 cup of the pumpkin sauce. Repeat layers one more time, garnishing with Parmesan cheese. Bake for 25-30 minutes. Let rest 5-10 minutes before cutting. Pumpkin-Parmesan Pasta Sauce: In a large saucepan over medium high heat, add olive oil. Add shallots and onion and saute until translucent. Add garlic and saute one minute more. Add pumpkin, broth, cream, vinegar and spices to the onion, shallots, garlic mixture. Stir to blend and simmer on low for 5 minutes. Gradually stir in 1/3 of the cheese to the sauce until blended. Repeat with another 1/3 of the cheese. When cheese is melted add remaining cheese. Stir in chopped fresh sage.